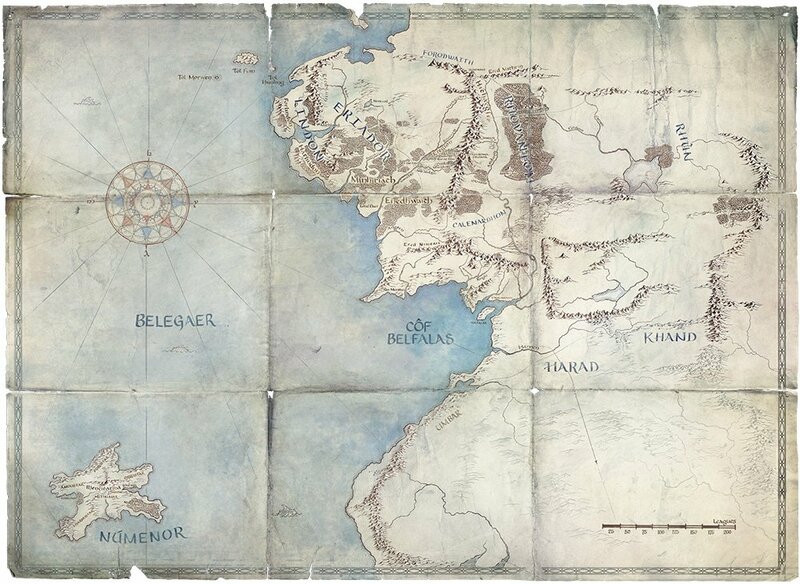 I've been digging in to the Tolkien canon (as published by JRRT and Christopher) to compare with the maps that Amazon has released in a set of marketing events for their upcoming TV show. Note that these "errors" are all quite minor, and I think the team at Amazon did an amazing job creating a Second Age map in particular as there is often contradictory information in all of the published materials (between books, editions, addenda and corrigenda) and there is no "correct" map to compare against, but they and we can get pretty close by close examination of the texts. If you see other errors in the maps, please let me know here or on social media @TolkienGuide. This map likely covers the end of the Second Age to possibly the middle of the Third Age based on landmarks shown. As there are numerous maps from this timeframe from JRRT and CJRT, there's not a lot to point at. Barad-Dûr should be Barad-dûr (small D). Tolkien never used a capital D for the dark tower. This map likely covers the middle of the Second Age based on landmarks shown. Rómenna should be on the southern shore of the bay. See Unfinished Tales p. 168 (text) and Tolkien's map tipped in between p. 168-9 (below). Tol Himling - In all of Tolkien's writings and maps, it is always labeled Himling (without Tol). As Tol just means "island" this probably shouldn't be considered an error, but Tolkien had every opportunity to use it and never did. On "The first map of The Lord of the Rings" (Tolkien: Maker of Middle-earth item 179, p. 399 - see below) he even labels one island "Tol Fuin" and the other one "Himling". Nîn-In-Eilph - Should be Nîn-in-Eilph - the "-in-" is never capitalized in any of Tolkien's works. The river Ninglor is always called Sîr Ninglor by Tolkien in his texts (never without the "Sîr" ("River"), though occasionally on other rivers he does use both ways). This one is probably ok either way but I think the preferred is with. As we do not know when these maps are "made" (in-story), it is impossible to say if there are errors in time-frame (or fudging of timelines for adaptation purposes). This section will have to remain blank until we learn more from Amazon. Great teamwork Jeremy! I think that Amazon team should hire us I would gladly volunteer for free. Ok, it is probably time for a discussion on roads. Thanks to many on social media for conversing with me about this (especially Shaun Gunner). I don't have any major complaints about Map 4, although the Great East Road should end at the ford of Bruinen and not continue on to the hidden stronghold of Imladris. Ok, after looking closely at the map in Unfinished Tales, I have to concede the point on this one - though the road doesn't go "into" Rivendell, it is clearly shown going pretty much exactly where Amazon put it. * Mithlond (The Grey Havens) eastward makes sense, continuing over the Misty Mountain pass and through Rhovanion as Men-i-Naugrim (the ancient Dwarf-road). * connecting Mithlond and Ost-in-Edhil (though that city should be further eastward, up the Glanduin river quite a ways) and on to Khazad-Dûm. Everything else goes nowhere, and I feel don't make sense until the settlements at their ends are in place. 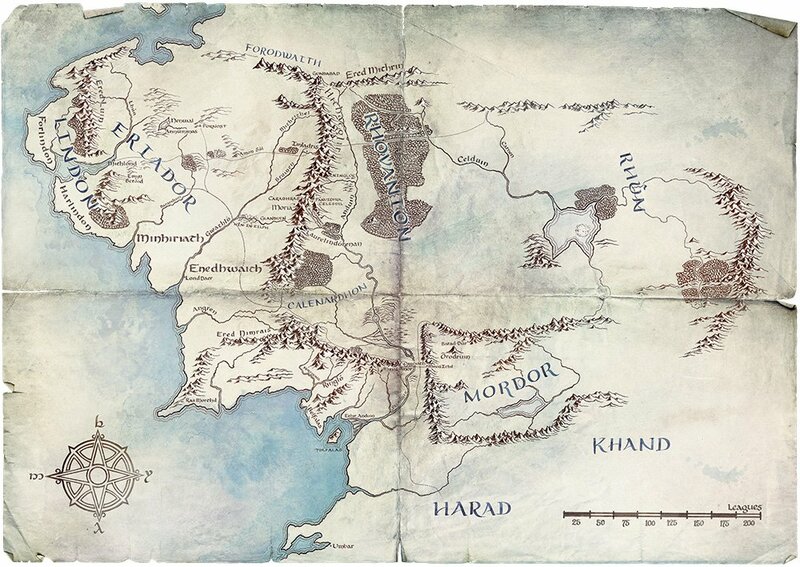 These were not paths that would be well traveled at all until the settling of Arnor and Gondor. And here is a lengthy and well-researched article about all of the Amazon Prime maps. The article is in Italian, but I was able to read it quite well using Chrome's auto-translate (because I am sadly not good at reading Italian). There are a lot of conclusions drawn that I think are based on quite tenuous evidence, but still a solid and enjoyable read. Thank you Jeremy! Great insights and a lot of them are in concordance with our previous analysis. Hopefully Amazon will take note. This particular nugget was pointed out by Beregond, Anders Stenström over on Facebook, thanks! Long ago Gorhendad Oldbuck, head of the Oldbuck family, one of the oldest in the Marish or indeed in the Shire, had crossed the river, which was the original boundary of the land eastwards. He built (and excavated) Brandy Hall, changed his name to Brandybuck, and settled down to become master of what was virtually a small independent country.... Their land was originally unprotected from the East; but on that side they had built a hedge: the High Hay. It had been planted many generations ago, and was now thick and tall, for it was constantly tended. It ran all the way from Brandywine Bridge, in a big loop curving away from the river, to Haysend (where the Withywindle flowed out of the Forest into the Brandywine): well over twenty miles from end to end. Tolkien, J.R.R.. The Lord of the Rings: One Volume (p. 99). Houghton Mifflin Harcourt. According to the Tale of Years, Buckland was settled in Third Age 2340 so the High Hay must have been planted (and become a landmark for the map) after this point. In my previous writeup on Amazon's maps, it appeared from named locations that Map 4 dates to the Second Age or early Third Age, between S.A. 3320 and perhaps T.A. 1000, and that Map 5 dates to S.A. 750 to circa S.A. 1000 (or perhaps up to S.A. 1600). It seems quite likely that the Amazon cartographer assumed the High Hay line was a stream and not the Hobbit-made landmark, thus this seems quite likely to be a mistake in the map and not a hint of Hobbit plot line in the TV series. According to this website, the Amazon Cartographer was John Howe, and Tom Shippey is also working with Amazon.